On 21 October 2017, the conferment of honorary degrees for the 23rd Congregation of PolyU was held. 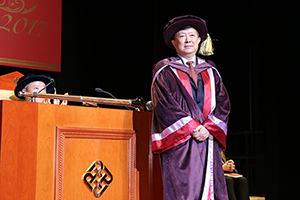 A Doctor of Science honoris causa was bestowed on Prof. Guanhua Xu, a prominent Chinese scientist in remote sensing, geographic information sciences and global change studies. Prof. Xu has played a pivotal role in promoting innovation in science and technology. In 2003, he organized a team of top scientists, economists and entrepreneurs to develop the National Outlines for Medium and Long-term Planning for Scientific and Technological Development (2006-2020). The document sets the strategic direction for innovation in China, transforming its economy through technology. 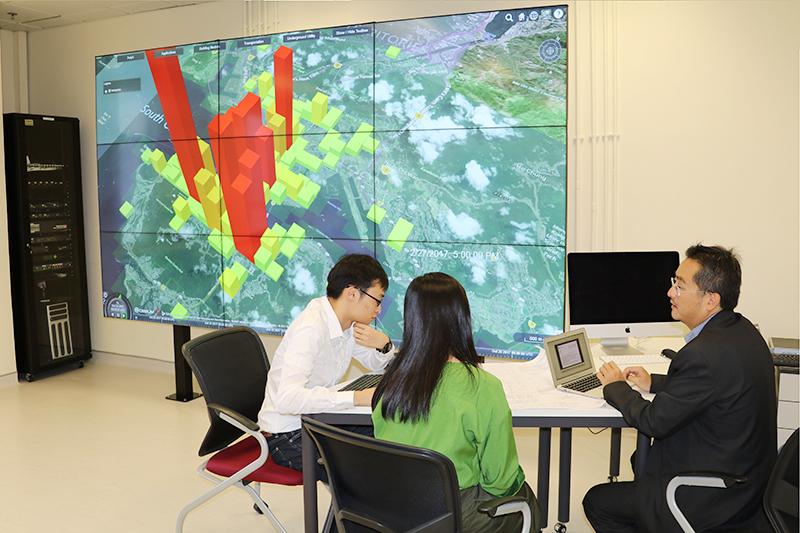 A driving force for multidisciplinary research to address societal issues like global change and sustainable development, Prof. Xu has facilitated many collaborations between the Department of Land Surveying and Geo-Informatics (LSGI) and mainland scientists. 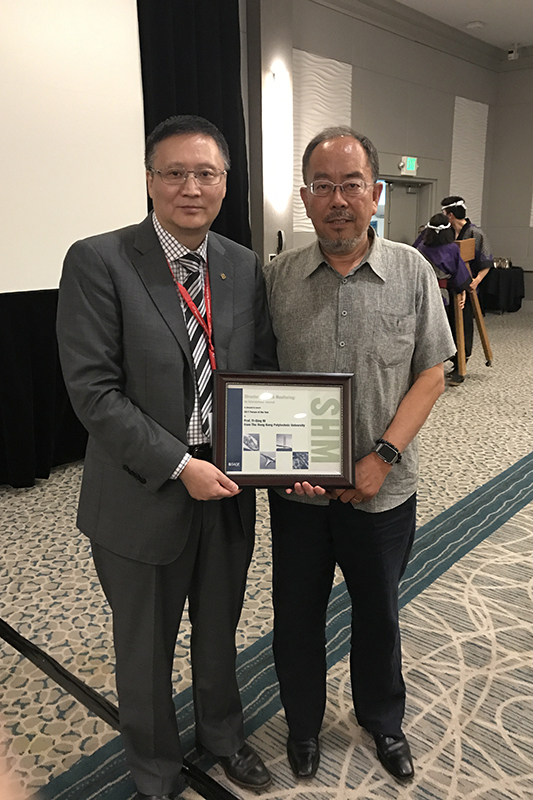 The editorial board of an international journal Structural Health Monitoring (SHM) recently presented Prof. Yiqing Ni of the Department of Civil and Environmental Engineering (CEE) the 2017 SHM Person of the Year Award at the 11th International Workshop on Structural Health Monitoring, which was held at Stanford University in California from 12 to 14 September 2017. 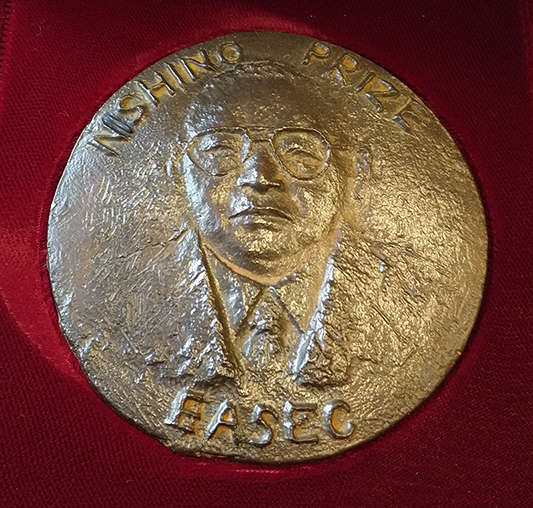 At the 15th East Asia-Pacific Conference on Structural Engineering and Construction (EASEC-15) that was held in Xian, China, from 11 to 13 October 2017, Dr Songye Zhu of the Department of Civil and Environmental Engineering (CEE) was honoured with the Nishino Prize. Typically presented to young scholars (age below 45 years) from the Asia-Pacific region, the prize is awarded in recognition of their distinguished achievements, contributions, and potential in the area of structural engineering and construction through research, development and practice. Several academic staff members of the Faculty of Construction and Environment (FCE) have recently been selected for the Faculty Awards for Outstanding Performance/ Achievement 2016/17. Individual awards went to Dr Barbara Siu, Senior Teaching Fellow of the Department of Civil and Environmental Engineering (CEE), for her outstanding teaching, Prof. Tao Wang, Chair Professor of Atmospheric Environment in CEE, for his outstanding research, and Prof. Patrick Lam of the Department of Building and Real Estate (BRE) for his outstanding services. Each of them will receive a cash prize of HK$10,000. A Teaching Grant of HK$100,000 will also be given to Dr Siu, who can use it for the purposes of staff development, attending conferences, or equipment purchases according to management guidelines. A team award in the teaching category went to Dr Charles Wong of the Department of Land Surveying and Geo-Informatics (LSGI). 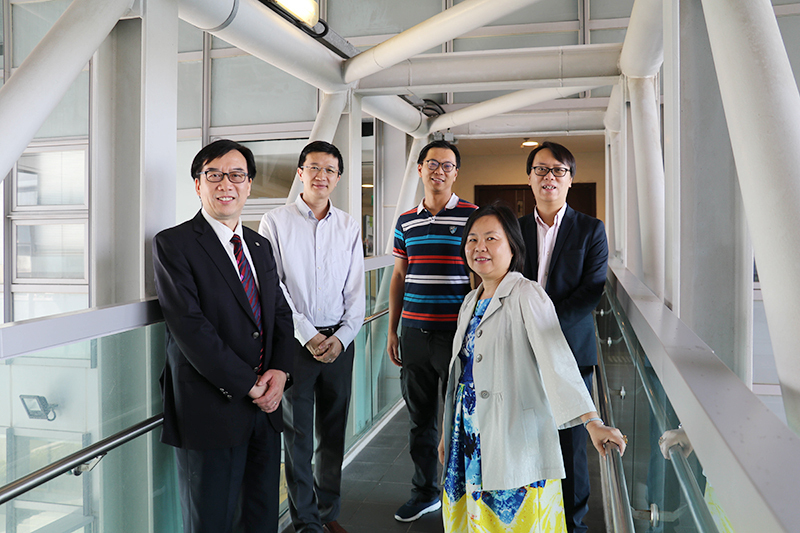 HK$20,000 will be awarded to his 11-member team, which included Prof. Xiaoli Ding, Associate Dean (Partnership) of FCE and Chair Professor (Geomatics) of LSGI; Prof. John Shi, Chair Professor (Geographical Information Science and Remote Sensing) and Head of LSGI; Prof. Esmond Mok, Dean of Students and Professor of LSGI; Prof. Wu Chen, Professor of LSGI; Prof. Janet Nichol, Visiting Lecturer of LSGI; Dr Lilian Pun, Associate Head (Academic) of LSGI; Ir Dr Wallace Lai, Assistant Professor of LSGI; Mr Roy Kam of the Educational Development Centre; Ms Ariel Mak, Project Associate of LSGI; and Ms Yao Han, Scientific Officer of LSGI. The annual Faculty Awards were established to motivate staff members to excel in their work performance and give recognition to those with distinguished achievements in the areas of Teaching, Research and Scholarly Activities, and Services. All the awardees of the Faculty Awards will be honoured at the Faculty Congregation and Prize Presentation Ceremony in late October/ early November. 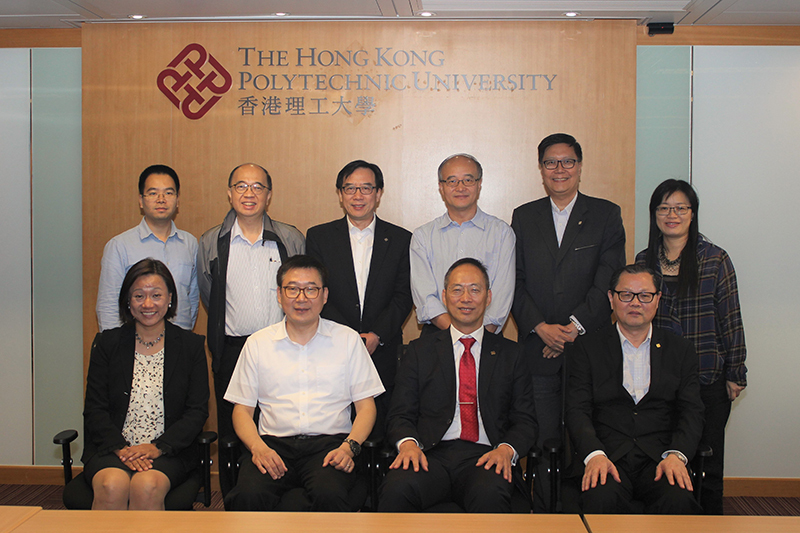 On 26 October 2017, Prof. Guoqiang Yang, Vice-President of the University of Chinese Academy of Sciences (UCAS), and Mr Ming Li of its Shenzhen Institutes of Advanced Technology, visited PolyU to discuss conditions under which the first cohort of graduates from UCAS would further their studies at PolyU. They were welcomed by Dr Laura Lo, Director of PolyU’s Chinese Mainland Affairs Office (CMAO), and Ms Annie Lam, Senior Manager of CMAO, before meeting with Prof. Alex Wai, Vice-President (Research Development), as well as the senior management of the Faculty of Construction and Environment (FCE), including its Dean, Prof. You-lin Xu, Associate Dean (Partnership) Prof. Xiaoli Ding, Prof. Albert Chan, Head of the Department of Building and Real Estate (BRE), Prof. William Lam, Head of the Department of Civil and Environmental Engineering (CEE), and Prof. John Shi, Head of the Department of Land Surveying and Geo-Informatics (LSGI). UCAS is a higher education institution established with the approval of the Chinese Ministry of Education. Its predecessor is the Graduate School of Chinese Academy of Sciences, which was founded in 1978 as the first graduate school in China by approval of the State Council. It began nurturing undergraduates in 2014, and will have its first batch of such graduates in 2018. 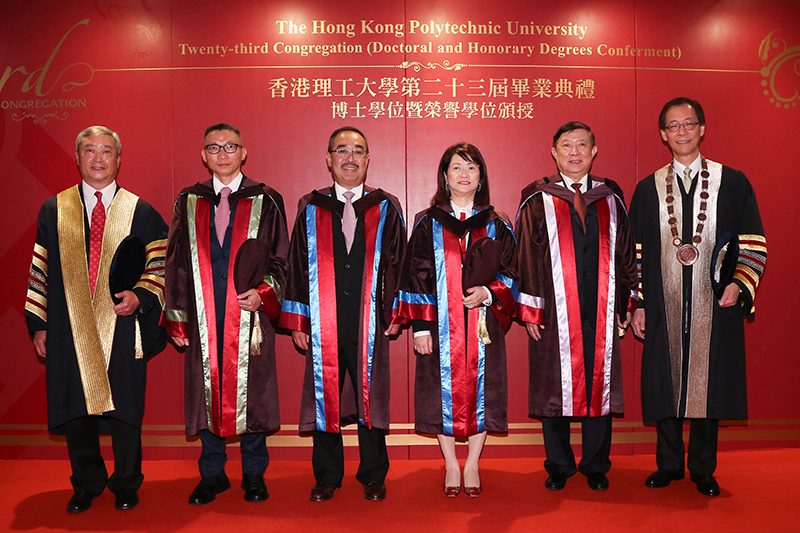 The meeting on Thursday will pave the way for these graduates to further their studies at PolyU, either for a taught postgraduate master’s degree or a PhD. 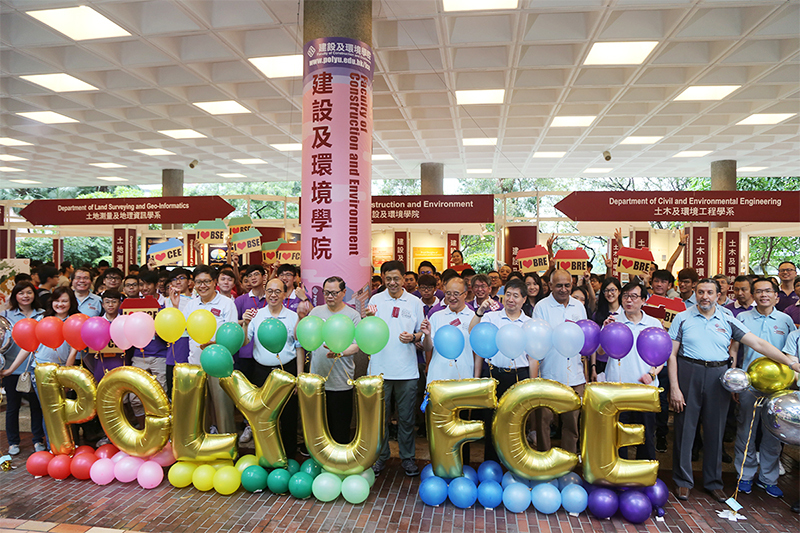 To promote its undergraduate programmes and reach out to the public, particularly secondary school students and their parents, PolyU held an Education Info Day on 30 September 2017. The central opening ceremony was officiated by the Deputy President and Provost, Prof. Philip Chan, and Associate Vice President (Academic Support), Prof. Siu-lau Ho as well as all the Deans of Faculties and Schools. In attendance were the 3 Associate Deans of the Faculty of Construction and Environment (FCE): Prof. Xiaoli Ding (Partnership), Prof. Geoffrey Shen (Teaching), and Prof. Xiang-dong Li (Research), as well as the Heads of the 4 departments in FCE: Prof. Albert Chan of the Department of Building and Real Estate (BRE), Prof. Asif Usmani of the Department of Building Services Engineering (BSE), Prof. William Lam of the Department of Civil and Environmental Engineering (CEE), and Prof. John Shi of the Department of Land Surveying and Geo-Informatics (LSGI). Together with Prof. You-lin Xu, Dean of FCE, the 3 Associate Deans and 4 department Heads also officiated at the Faculty opening ceremony. In addition to exhibitions, there were also consultation sessions and 15 information seminars by departments of the Faculty, including one for the Broad Discipline of Construction and Environment (BDCE). At the BDCE seminar, presentations were made by the Associate Dean (Teaching), Prof. Geoffrey Shen, and the Broad Discipline Leader, Prof. Yat-hung Chiang, who respectively introduced FCE and BDCE. At the other information seminars, departmental representatives made presentations and answered enquiries from the audience. It was a great opportunity for potential students to learn more about the Faculty and its programmes. 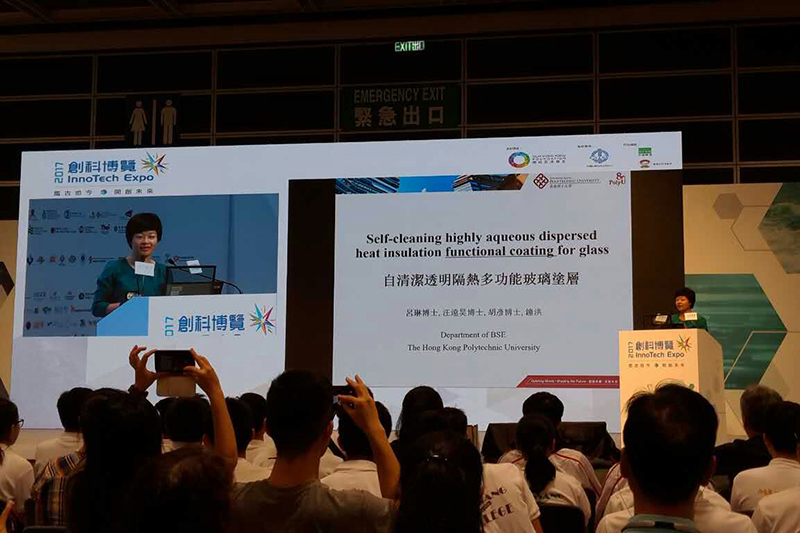 At the InnoTech Expo at the Hong Kong Convention and Exhibition Centre on 28 September 2017, Dr Lin Lu of the Department of Building Services Engineering (BSE) introduced her award-winning project on multi-functional nano-coating for glass to the public. Her seminar was well received by the audience, which included more than a hundred middle school students. The Department of Land Surveying and Geo-Informatics welcomed a new assistant professor, Dr. Yang Xu in October 2017. Dr Xu’s work lies at the intersection of geospatial science, transportation, and urban informatics. He obtained his BSc in Photogrammetry and Remote Sensing and MSc in GIS – both from Wuhan University – in 2009 and 2011 respectively. He received his PhD in Geography from the University of Tennessee, Knoxville in 2015. Dr Xu has extensive work experience in world-leading research institutes. From 2013 to 2015, he worked as a part-time research associate at the Oak Ridge National Laboratory (ORNL), where he used software engineering approaches and web-based information visualization to address research challenges in environmental projects. He was also a joint postdoctoral associate (from June 2016 to September 2017) at the MIT SENSEable City Laboratory and the Singapore-MIT Alliance for Research and Technology (SMART), where he focused on human mobility mining and modeling based on large-scale urban datasets. Dr Xu received an Exceptional Professional Accomplishment Award from the University of Tennessee, Knoxville in 2015. He has delivered many presentations at professional meetings (e.g., GIScience, GeoComputation, and EmTech), and high-quality papers in prestigious journals (e.g., Annals of the American Associations of Geographers, Transactions in GIS, and International Journal of Geographical Information Science). The Department of Land Surveying and Geo-Informatics (LSGI) recently briefed local media on its plans to rename its undergraduate course from Bachelor of Science (Hons) in Geomatics to Bachelor of Science (Hons) in Land Surveying and Geo-Informatics in the next academic year. The new course structure will combine the 3 disciplinary streams of land surveying, geo-information technology, and underground utility surveying into one, with added subjects on smart city that will provide students with more comprehensive knowledge to take advantage of diverse job opportunities in this area. Chair Professor and Head of LSGI, Prof. John Shi hopes LSGI will nurture students for the development of Hong Kong into a smart city. Associate Head of LSGI, Dr Lilian Pun, said the high diploma course of LSGI would also be restructured to facilitate the transition of its graduates to the undergraduate programme. Moreover, LSGI will officially open a Laboratory for Smart City and Spatial Data Analytics later this year. Its Underground Utilities Survey Laboratory is already a pioneer for research on smart city, providing students with real life experience in identifying underground problems caused by utility pipes and voids that can be fatal. 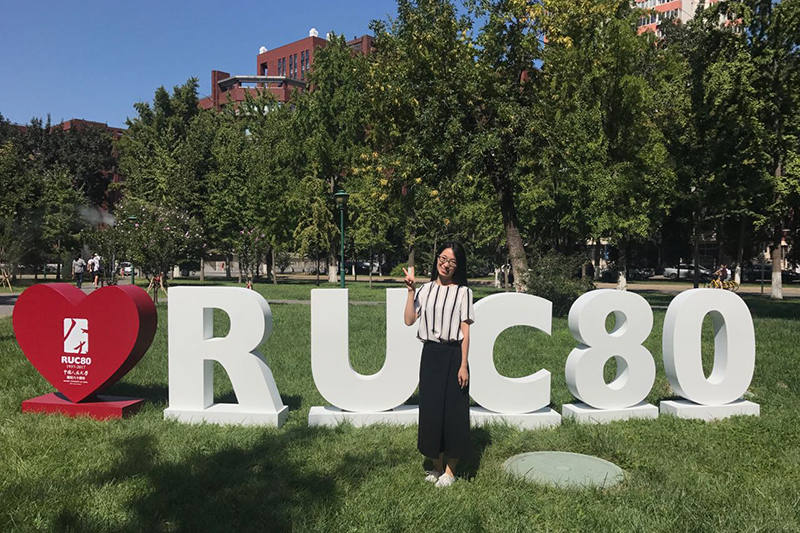 A 2017 PhD graduate of the Department of Building and Real Estate (BRE), Dr Shan Guo, has been offered a post as assistant professor in the Department of Land Management at the Renmin University of China (RUC). Dr Guo received the Outstanding Young Scholar Award of RUC for her academic achievements. She was a recipient of the Hong Kong PhD Fellowship at PolyU under the supervision of Prof. Geoffrey Shen. Her research is mainly focused on China’s sustainable land use and modeling the water-land nexus. The date and topic of each lecture will be announced in due course. Applications from both local and international students are now invited for the following undergraduate and taught postgraduate programmes. Brief Introduction: As a student-run organization in building and construction, the International Council for Research and Innovation in Building and Construction (CIB) PolyU Student Chapter welcomes all research and post-graduate students from the Faculty of Construction and Environment to become a member. Membership applications are accepted all year round.